Being addicted to painting my nails and looking after my hands, I am always on the lookout for hand creams that are not only effective in moisturising my hands and keeping them soft, but that also smell good and have a non-greasy formula. The last one of these is almost the most important thing to me - although I know I shouldn't be, I am attached to my iPhone, iPad and laptop - so I don't want greasy prints all over my screens and keyboards. I always like a product that comes in a box - gives it added luxury, I think! So when I was asked if I wanted to try out Weleda's Sea Buckthorn Hand Cream the answer was definitely yes, please. I'm not very familiar with Weleda, but on doing a little Googling, I discovered that they are 'the world-leading manufacturer of holistic natural cosmetics and pharmaceuticals for anthroposophical therapy'. 'Anthroposophical?' I hear you ask (even if you did have to read it out in syllables at first - so did I). Well, for once, my day job meets my blogging and I can tell you that it literally means 'human wisdom' (from the Greek 'ἀνθρωπος' meaning man and 'σοφος' meaning widsom) and from what I've read, it sort of comes down to spiritual science, having been originally established by scientist and philosopher Rudolph Steiner. However, I realise I digress. What's important here is that Weleda's products are all made of pure natural substances and no artificial preservatives are ever used - and I like that. Who doesn't like trying to use natural products on their skin? It seems to be a direction a lot of brands are going in, trying to keep up with the demand from consumers who want to know and understand ingredients in products and feel that we're not pumping chemicals into our bodies that we don't really know how will affect us in the long run. Sea buckthorn was apparently used originally to give horses a shiny coat and help improve their eyesight! However, more recently it's been discovered that the plant's berries have a super-rich cocktail of antioxidants and human health benefits - such as protecting the skin from UV radiation and free-radical damage associated with premature signs of ageing. 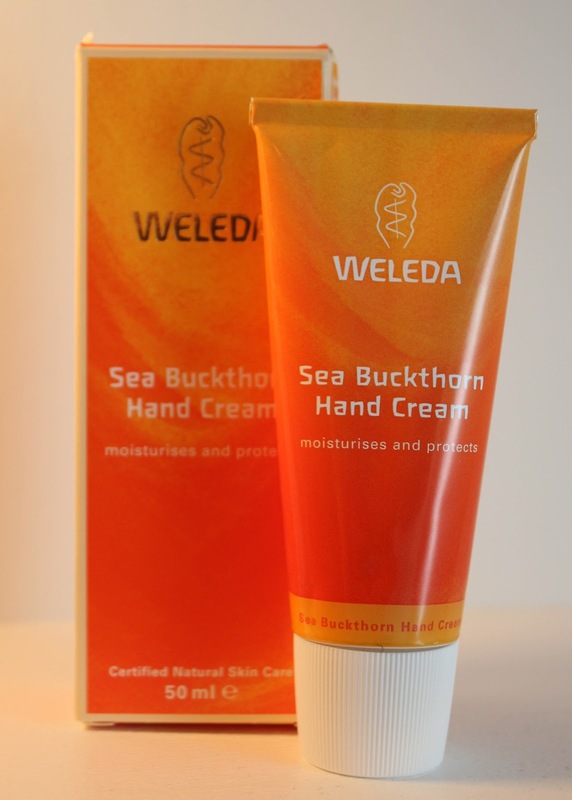 The Sea Buckthorn Hand Cream has a really lovely light formula - it is so smooth to rub in and has a subtle fragrance that reminds me of ginger - but maybe that's the sesame oil in it that I can smell. The mandarin is certainly noticeable, too. I put the hand cream on just before writing this post to see how quickly it would be absorbed - and my keyboard is definitely not covered in greasy fingerprints and in fact now my hands just feel soft and recently-moisturised. They did get a slightly strange tingling for a little bit after I put it on, which I haven't experienced with a hand cream before. 1) Moisturising and softening? Yes. Will it permanently replace my absolute favourite hand cream that I wrote about in my nail care favourites post? 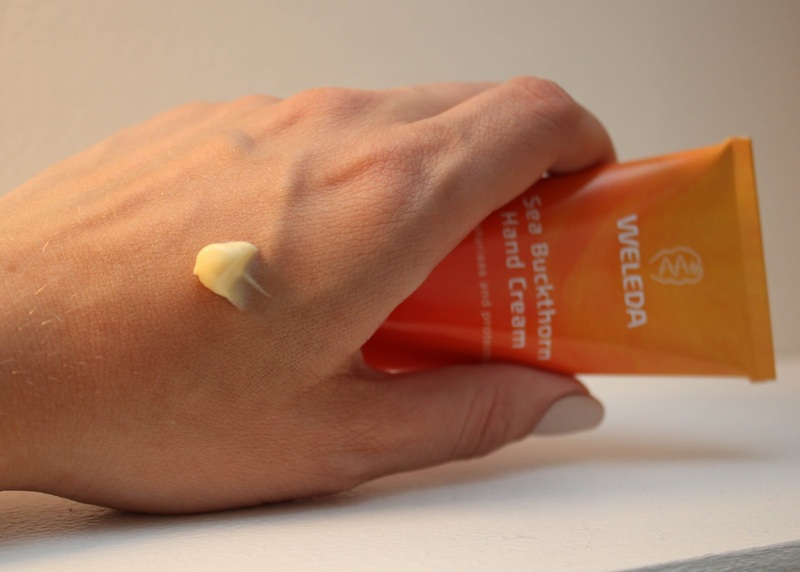 Probably not in the long run - but for now, since my Caudalie tube is almost empty, this Weleda one is a very good alternative - and it's a little bit cheaper too. Although it's currently out of stock on the Weleda website, it is available on lookfantastic.com for £7.95 and feelunique.com for £8.50, both for the 50ml tube and free delivery.